Dr. Patterson’s bedside manner was amazing! She took the time to listen to, understand my concerns, and addressed each oneof them thoroughly. Very pleased! Dr. Patterson’s bedside manner was amazing! She took the time to listen to, understand my concerns, and addressed each one of them thoroughly. Very pleased! Very nice I didn't feel like she was rushing to get to the next appointment. She took time to answer allquestions. Very nice I didn't feel like she was rushing to get to the next appointment. She took time to answer all questions. **PATIENTS Please Be Advised: Please expect a call from our office upon booking your appointment. Please be sure to include your INSURANCE ID while booking to ensure we can see you. 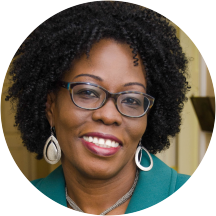 Born the eldest of six children and a native of Jamaica West Indies, Dr. Jacquline Hayles-Patterson recognized at an early age her passion for higher education. She graduated from St. Andrew High School for Girls in 1986 then migrated to the United States. Throughout her developmental years, her parents constantly encouraged her to be the best she could be in all of her endeavors. She was accepted at the University of Medicine and Dentistry of New Jersey. She found that that she had especially enjoyed her rotation in obstetrics and gynecology, and thus decided to pursue her medical career as an Obstetrician/Gynecologist. In 1998, she completed residency in OB/GYN at Newark Beth Israel Medical Center in New Jersey. After completing residency training, Dr. Hayles-Patterson relocated to Georgia with her husband and two daughters. She worked in metro-Atlanta initially for one year and then in Augusta, Georgia for two years. She then returned to metro-Atlanta in 2005, and has worked at Signature Women’s Healthcare since that time. She successfully passed her board specialty certification and is a Fellow of the American College of OB/GYN. She enjoys general OB/GYN and has a special interest in laparoscopic pelvic surgery, gynecologic surgery and high-risk pregnancy. I am a returning patient of Dr. Hayles-Patterson. The medical care provided was as great as ever and I would highly recommend this practice. She did not seem to really care about the issues I was presenting to her. Had the routine tests done and she did not seem interested in helping me solve more other issues. Did not make me feel like she wanted to help me. She was very patient caring and concerning. She has a solution to every problem and met my every need. I appreciate her service. She was informative, although I was uncomfortable with having an intern in the room with me giving permission. I didn't feel comfortable discussing issues I needed to discuss. The doctor was pretty good just seemed hectic that day, I waited over an hour to be seen, and when I was seen in felt the process was rushed. My visit with Dr Patterson was good. Her staff were very professional & respectful. Dr Patterson discussed all my issues and told me about all the options I had available for treatment. Dr. Hayles is great. I went to see her with my previous pregnancies so when #3 came around, I knew where I was going! The staff is awesome and very friendly. I've never had a problem with her office or anything of the sort. I would recommend this Dr highly. She took the time to go over my history and my concerns. She allowed me time to speak with her and was good at offering suggestions on my questions. I will go back to see her for my next visit. It was much improved since my last visit where everything was more organized with the receptionist sending me electronic forms to complete at my leisure prior to my appointment. Far better than having to do so in the waiting area of the Doctor's office.